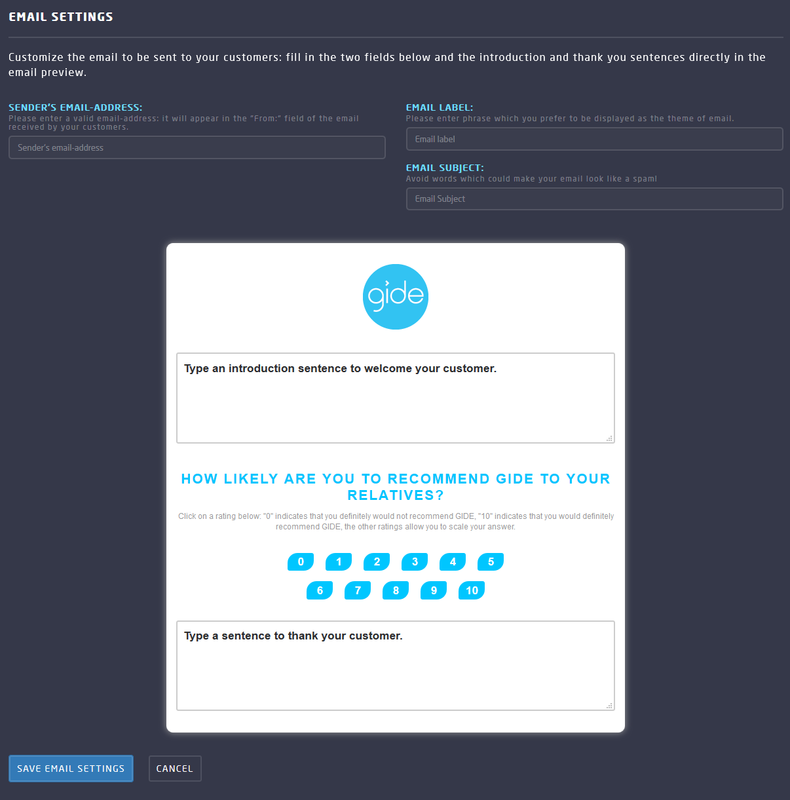 The best way to track your customers' recommendation level! CREATE a NPS® survey for your brand, quickly and easily! ANALYSE your Net Promoter Score® and customers' feedback. GROW YOUR BUSINESS, find easy innovation, take advantage to increase Customer Experience, enjoy recommendation everywhere. 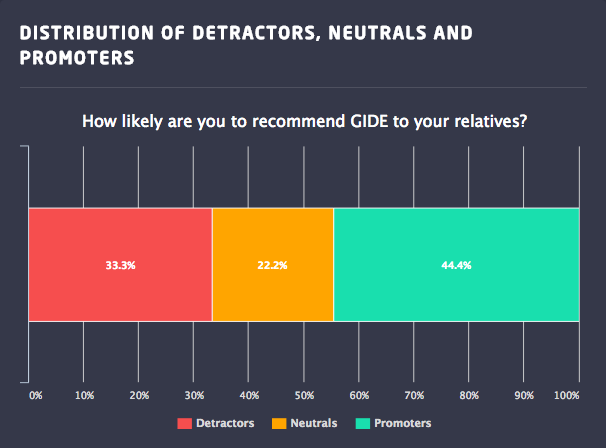 The NPS, or Net Promoter Score, is a performance indicator that measures the propensity of your customers to recommend your business to relatives and colleagues. The NPS was theorised by Fred Reichheld and Bain & Company in 2003. The results of the study by Fred Reichheld demonstrate a correlation between the NPS and the growth of a business. Organisations that have a high Net Promoter Score grow 2 to 4 times faster than their competitors! The NPS system seeks to measure not just customer satisfaction, but it gauges whether customers like your company so much that they'd tell their friends about it. It does this by asking one core question. The first question of the NPS is a graded rating which does not tell us: "Why would you not recommend my company?" or "How can I convince you to do so?". So we have improved the basic NPS by adding an open-ended question: this second question lets you collect feedbacks which will tell you more about the Customer Experience. By identifying your Detractors, you will be able to meet their discontent and then close the loop. How is the NPS calculated? "On a scale of 0-10, how likely is it that you would recommend our company/product/service to a friend or colleague?" Detractors are slowing down your business and your revenue growth. Passives are satisfied with your company/product/service but they wouldn't particularly recommend you. Promoters are delighted with their Customer Experience. You have made a difference against a competitor. They will recommend you to their family... or share their experience on their Facebook wall! The NPS is calculated by % of promoters LESS % of detractors. The score ranges between +100 and -100. Generally a score above 0 is positive. For example, the NPS average of the companies in the USA is 15. A Net Promoter Score above 50 is excellent (Apple and Amazon have a NPS around 60). Who should use the NPS? All companies wishing to influence their recommendation rate and use a key performance indicator: the NPS is used by many large companies. Now, my-NPS renders the Net Promoter Score affordable for small and medium sized business, so why not you? Why should you use the NPS? Because the NPS is an efficient and easy-to-deploy tool to understand and consider your customers and prospects. "Your most unhappy customer is your greatest ally", according to Bill Gates! But why? Simply because they offer valuable information and this will allow you to find areas for improvement and create the "Wow!" factor. The NPS question (also known as "the Ultimate Question"!) relates to a recommendation rating not to be mistaken with a satisfaction rating. So, boost your business recognition! With my-NPS , you can manage and deploy as many NPS projects as you want, from A to Z without having to jump from one site or tool to another. It's intuitive, easy and good for innovation... and your business! You will find advice and good practices in this exclusive white paper and video tutorials to master my-NPS interface. 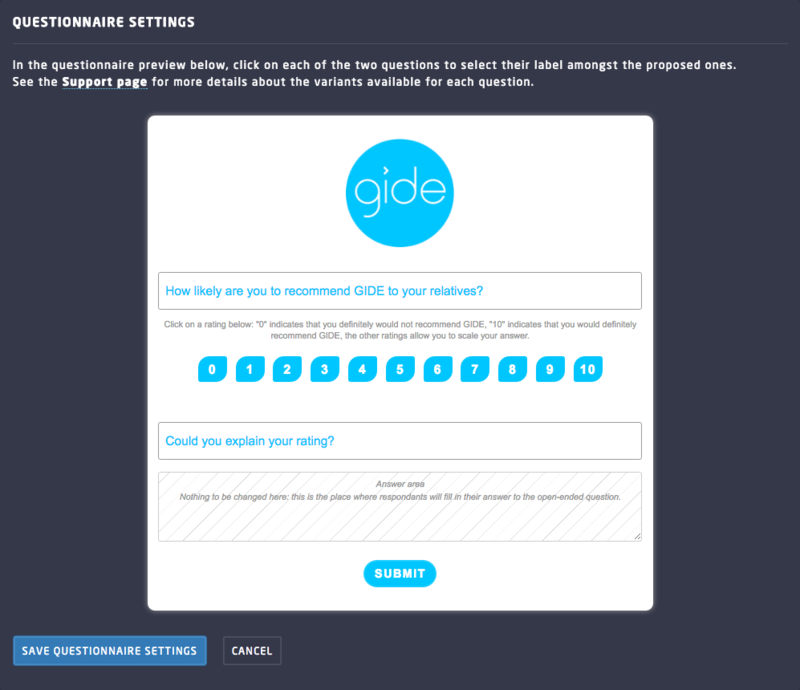 This screenshot shows the panel which lets you select the question you will ask through your NPS survey: you will choose it according to your project and the targets that you are interested in (B2B, B2C). 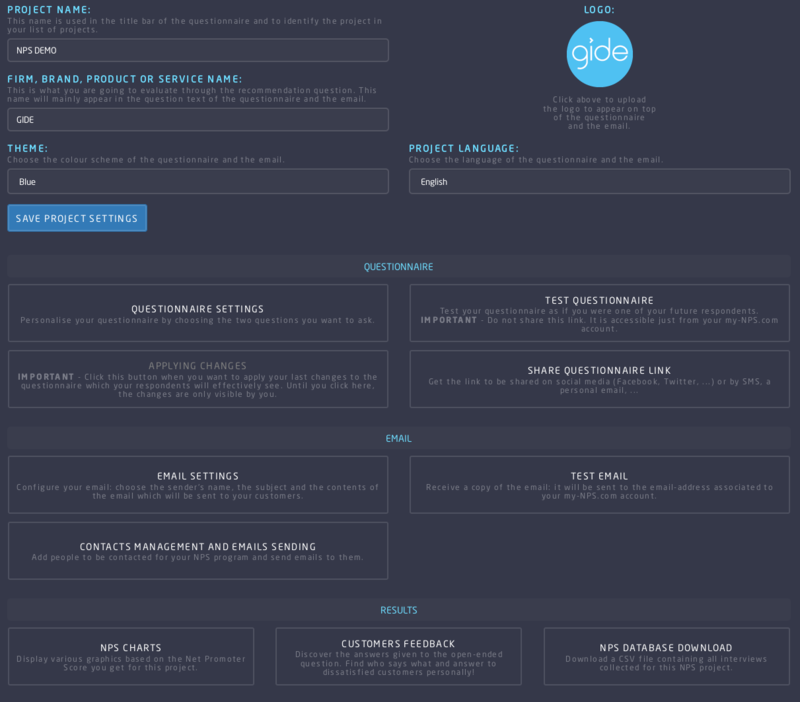 Through this panel, you will configure the email that your customers and prospects will receive. You can customise the sender's name and email-address and the subject of the email, write an introductory sentence as well as a thank you sentence. And don't forget to choose a colour theme and upload a logo! my-NPS gives you access to the results in different ways: charts, list of verbatims, database download. This is one of the charts you will get: it shows the structure of the population that have taken part in your NPS program. Carefully analyse the percentages of promoters, detractors and passives... and read our White Paper to learn more!